BBC News 22 February 2016: Are you a cat person? 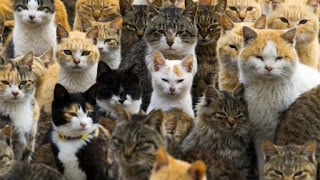 If so, Japan is the place to be on 22 February because this is when Cat Day is celebrated. Now in its 30th year, Cat Day has lit up Japanese social media with endless portraits of ...cats as well as cat-themed doughnuts, cat-shaped biscuits, cat manga, cats staring soulfully out of windows, kittens mewing expectantly and so on. On this day it is Japan's hugest trend on social media. What happens on Cat Day? 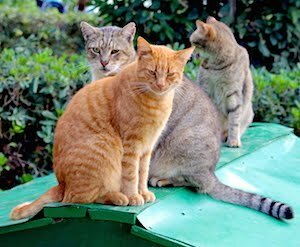 Known as "Neko no Hi", it was chosen because the date's numerals, 2/22 (ni ni ni), are pronounced fairly closely to the sound a cat makes in Japan (nyan nyan nyan)...read on.